« *** WINNERS *** Lisa and Sue are Living the Life of Riley! CONGRATULATIONS! I also recently discovered the damaging effects that our laundry detergent has on the environment. 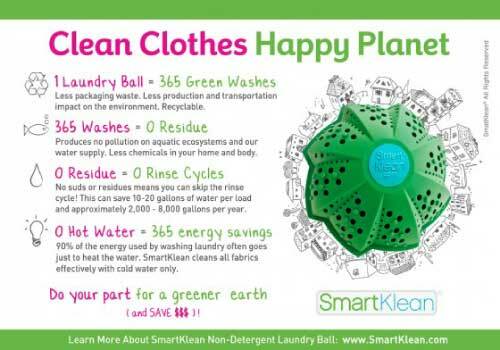 Thankfully, SmartKlean has set out to provide a more cost-effective, eco-friendly and chemical-free way to clean our clothes with the SmartKlean Laundry Ball. Keep reading to learn more! 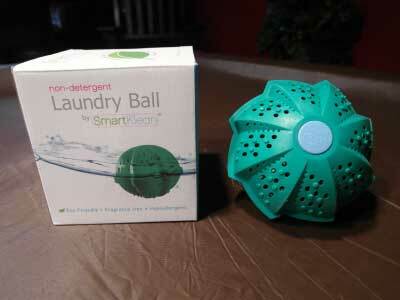 I reviewed the SmartKlean Laundry Ballfrom SmartKlean, which retails for $45.00. The SmartKlean Laundry Ball works quickly and easily to get your clothes clean and smelling fresh. Simply place it in the washing machine among your dirty laundry. Wash your clothes as you've always done, but WITHOUT the rinse cycle. Since the SmartKlean Laundry Ball doesn't use any form of soap or detergent, your clothes no longer need to be rinsed, which will save gallons of water on each and every load. Your washing machine will also not require as much electricity by skipping this cycle and your laundry will be cleaner, faster. Remove your clean clothes and leave the laundry ball in the washing machine for the next load. Once a month, let your SmartKlean laundry ball have a 1-2 hour long sun bath of its own to regenerate the ceramic beads inside and keep it functioning at its maximum cleaning power. So how does a small green ball do all of this work and get your clothes super clean? The SmartKlean Laundry Ball is filled with many ceramic beads, each comprising a combination of different minerals. When these ceramic beads come in contact with water, they form oxygenated water. The water molecules are then fragmented into smaller sizes, increasing the water’s dissolution power and enabling better penetration into the fabric’s pores, therefore releasing dirt, grime and odors. This is similar to the effect of detergents on water, but at a molecular scale without harsh chemicals. The natural ceramics are formulated to leave no residues behind on both your clothes or the environment. No residue means it produces a 100% safe and worry-free wash for the whole family, as well as an extended lifespan for your clothing. Fine or heavy fabrics, colors or whites, your laundry is fresh, safe and clean! I can remember when I first brought Riley home from the hospital, I used a ton of the very expensive, baby-safe, hypoallergenic detergent on her clothing and bedding. Now, with the SmartKlean Laundry Ball, that's no longer necessary. Since this laundry ball is 100% chemical and residue free, newborn babies and those with allergies and other skin sensitivities can enjoy fresh, clean clothing, at a fraction of the cost of using specialty detergents! With SmartKlean, there is no need for fabric softeners or dryer sheets either. It is important to note that even the trusted eco-friendly, hypoallergenic laundry detergents may contain SLS and SLES, which the SmartKlean is completely rid of. Of course, the SmartKlean Laundry Ball also does so much better in terms of our planet and its fragile intertwined ecosystems. I recently discovered that the laundry detergent we use frequently winds up in our streams, rivers and oceans because waste-water treatment plants simply can't remove it completely from our water. This excess buildup of detergents causes "dead zones" or oxygen-free areas of water, which obviously kills the living things in that zone. The phosphates or its alternatives present in detergents have also been shown to greatly reduce the ability of aquatic organisms to breed. What's more, since the SmartKlean Laundry Ball has an average lifespan of 1-3 years, the amount of waste produced due to large, bulky plastic jugs and containers is greatly reduced too, not to mention the carbon footprint associated with manufacturing all of this packaging in the first place. You can even save money by reducing the electricity it takes to heat the water you use during a normal washing cycle, since the SmartKlean Laundry Ball uses cold water only! I was blown away by the ton of benefits and savings that come from using these laundry balls. Disclosure: I received the SmartKlean Laundry Ball from SmartKlean in order to facilitate my review. No other compensation was received. This product review is based on my own personal experiences with this item and is completely honest and objective.